Pours a medium amber hue with a short-lived fizzy white head with some somewhat clingy lacing. Body clarity is brilliant with very little activity. Settled color is a golden amber color. Initially, the nose detects a warming pumpkin spices, full of cinnamon, nutmeg and ginger. Overall, the spices have a somewhat mellow aroma and are balanced with a light malty presence. A warming alcohol presence was also detected, but not overpowering. Initial taste is moderately sweet with a plethora of spices, but the finish provides even more sweetness from the alcohol warmth and the heavy dose of malts. Actively carbonated and light to medium in body, the Smashed pumpkin ale is rather watery in texture. A very slick/oily film coats our palates, leaving a sweet sugary taste on our mouths. Slightly warming alcohol presence was noted, but it was rather subtle and not burning as you may expect. What makes this different than the Shipyard Pumpkinhead? Double the ingredients, double the ABV (4.8 vs. 9.0), and a more subtle pumpkin spice characters. 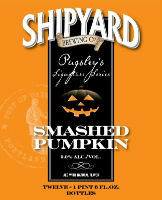 The smashed pumpkin (not smashing pumpkins) is true to it\'s name. If you attempt to drink this beer in one sitting (by yourself), you will be smashed - as a result of this powerful pumpkin. Reviewed on September 27th, 2009.